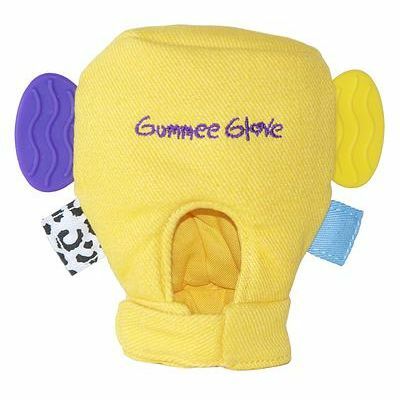 Get this Yellow Baby Teething Mitten Gummee Glove for your little one today! This teething mitten is made from 100% cotton and features different textures on the tags which provide hours of fun. The white and black contrasted square also makes crinkly noises to keep your little one interested. Taking hygiene into account, this teething mitten makes it so much more convenient for busy mums. The adjustable Velcro closure secures the mitten safely to baby's hand and stops it from dropping onto the floor. This teething mitten is perfect for those who are too young to grasp other soothers. It's BPA, Phthalate and Latex free, and meets all Australian Standards.